Blue ricordea is one of the more uncommon and stunning of the Florida Ricordea color morphs. Blue Ricordea polyps are mostly dark blue, with light blue or purple highlights on the tentacles, and either pink or fluorescent green mouths (usually green). They are generally about 1.5 in diameter when fully inflated, but they may get a little bit bigger once they get acclimated into your system. 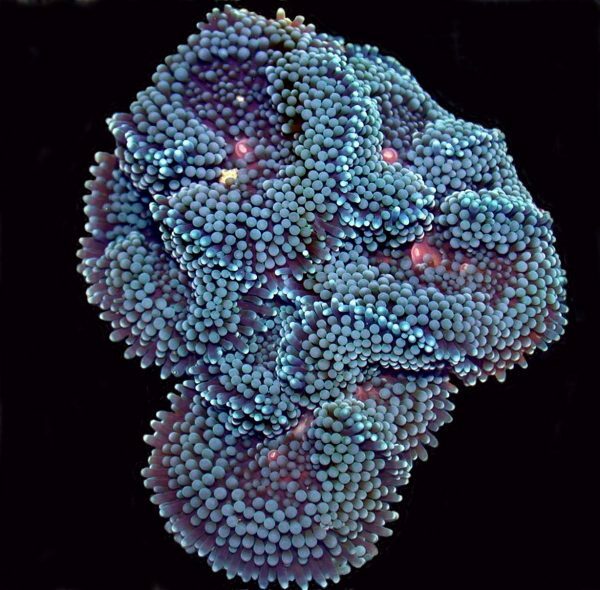 These are loose polyps and are not attached to any significant amount of substrate. They will eventually attach to any clean substrate in your tank, or you can epoxy or superglue them to what ever you want. They can take intense light, but will thrive in medium light conditions as well. Sometimes you just have to experiment with the placement to get the best color results. All of the Blue Ricordea we sell are extremely hardy and are great for any level of reef keeper, from the novice to the pros. They are primarily photosynthetic, but should be fed some sort of supplemental planktonic foods. In the wild they eat the organic dust and silt that settles on them, so when feeding them, dust them with food. 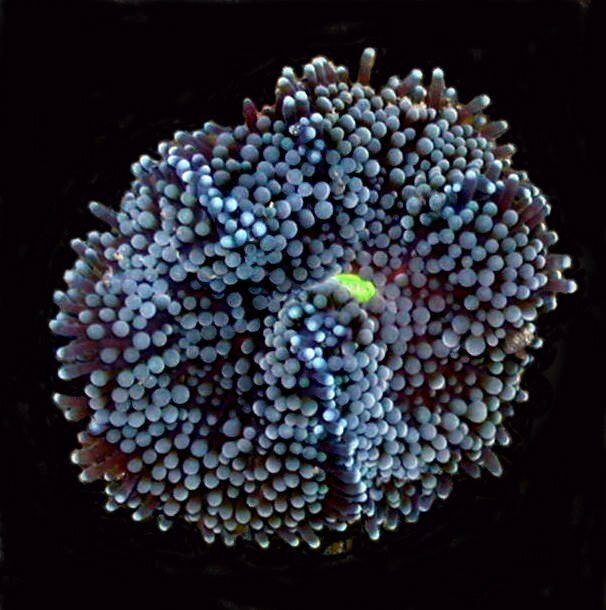 Ricordea reproduce primarily by division, so eventually the polyp will form two mouths and begin to divide. Many people help this division process along by cutting them in half between the mouths. This may seem radical, but it works and they almost always survive the process. If you are pondering doing this, I would suggest you do some more homework before you try it. Ricordea ship very well by priority mail and can easily survive a three or four-day ship time. A very deep blue ric with bright green mouths. Awesome. Great , Healthy polyp. ordered a single mouth, and got a double size about 2 inches! nice color right out of the bag. Great color, nice size. Order a single mouth, received a double! The individual I received was a bright blue with multiple mouths- beautiful! I am absolutely amazing at all the ricordea I received from KP aquatics. I highly recommend this seller. PS. pay extra and get a double mouthed individual- you wont be disappointed. Ordered a single mouth ric and got one with at least three mouths. Beautiful specimen/s can’t wait for it to split. I just got this yesterday. Its pretty big and under my standard Biocube lighting it looks like a light blue, its very pretty! The one i received had a great color, a bright green mouth and was very healthy. Great color, very healthy, even after longer than anticipated shipping. I also got a freebie. I’d highly recommend this, it just adds a little color to any tank. I ordered one of these and got a bright blue ric with a pink mouth. I think it’s my favorite! Opened up immediately. Packed very well. Thanks! the blues you will get vary sometimes. some are deep blue, others are lighter, all have been nice. Purchased several rics from Ken in various colors and they are all doing very well, in fact a few have already split and nearly doubled in size! Mine seem to prefer lower to medium light levels and lower flow. ordered one of these for a friend. he is very pleased. infact, he placed his own order shortly after getting it. Just got everything in and looks great.Even got 2 freebies.Will be ordering again soon. I received my order today and Im so pleased that I can’t wait to order some more! The color is amazing, if your looking for a beautiful mushroom don’t pass this up. Hats off to Ken for great customer service and providing me with some beautiful mushrooms. Awesome colors on these shrooms. Thanks for another great shipment. Already opening after only two hours in my tank. Thanks for the freebee too!!! These are awesome..doing very well, shipped quickly and sent extra items! What could be better!